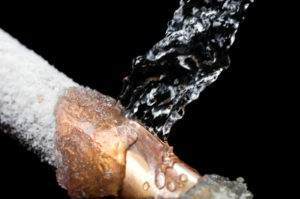 Frozen or burst pipes are often a problem in our area during the winter, especially in cold winters like we have been having where the temperature stays far below freezing for days at a time. If you are away from your home or business, you may not find out about the flood aftermath from frozen pipes until you return or get a call from a neighbor. Pipes freeze much more easily when no water moves inside the pipes; for example when a boiler shuts down due to debris, or when nobody is home. Pipes in basements, crawl spaces, and garages are very susceptible to freezing. If you are home, the first sign of a frozen pipe is no flow or reduced flow from a plumbing fixture like a faucet or bathtub. When water freezes, it expands quite a bit, which causes pipes to burst from the extra pressure. The burst pipes then lead to a flood that will cause great damage to your home or business. If you are on-site, turn off the main water valve to the house call us immediately. Do not use an open flame to attempt to thaw the pipe. Call us without delay so that we can take the appropriate steps to handle the problem and prevent further damage which could be catastrophic. If you do have a frozen pipe that has burst, the good news is most homeowners and business insurance policies do provide coverage for burst pipes. Call us before you call your insurance company and we will get to your home or business within an hour. Insurance companies can be slow to respond to your calls, especially in the middle of the night. We respond immediately. The longer you wait for flood cleanup and restoration, the more time the flood has to weaken the structure of your home or business and cause mold growth. We provide mold remediation, to keep your home a safe place for your family. We are licensed to remove asbestos and lead-based paint that may be revealed by a flood, both of which can also be extremely hazardous to your health.